Intensive pre-shampoo treatment that works with bonding cream to offer hair regeneration for over-processed hair. 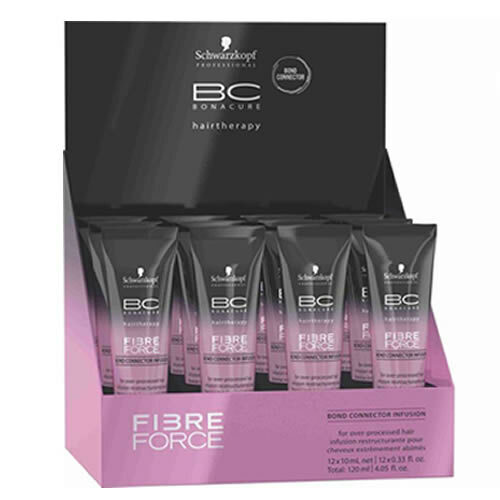 Schwarzkopf Professional BC Bonacure Fibre Force Kerabond Infusion is an advanced reconstructing formula that recreates missing bonds from the inside of the hair. It will improves the overall quality and appearance of your clients' hair for up to 60 days. This pre-shampoo treatment aims to intensively repair and re-bond damaged hair thanks to Schwarzkopf's patented ‘Bond Connector Technology’—a combination of 2 complexes that deeply reconstructs and seals each individual hair strand and offers 10 times more resistance to breakage. When mixed with Schwarzkopf's Fibre Force Bonding Cream, it provides each hair layer with keratin, meaning long-lasting repair and maintenance. Simply apply the mixture to the medium lengths and tips of dry hair, distributing the mixture well into each part of your hair. Leave on for 5 to 15 minutes to let it take effect and then rinse thoroughly before shampooing.